TQP is a powerful value-based philosophy and a wonderful pilgrimage of continuous learning and improvement leading to holistic happiness and success. It is a spiritual odyssey based on Indian Ethos and Scriptures. Keeping this thought in our mind we have tried to give a platform to groom professionals and learn new things through the Faculty Development Programme on Total Quality Person. 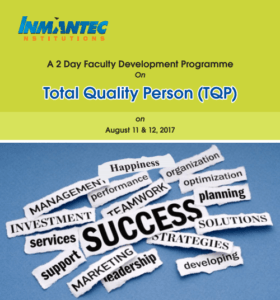 It is our pleasure to share with you that INTEGRATED ACADEMY OF MANAGEMENT AND TECHNOLOGY (INMANTEC), Ghaziabad is going to organize a Two Day Faculty Development Programme on “Total Quality Person” on August 11 & 12, 2017. I hope it would help in awakening the inner potential of the all participants. We are confident that the participants will find it a great learning and sharing experience due to the content and context of the topic and eminent trainer, having long experiences in Academics as well as Corporate. I would like to invite you to participate in the Faculty Development Programme personally and also request you to nominate some Faculty Members from your Institutions to encourage us in this endeavor. We look forward to your presence and participation to make the FDP a great success and achieve its goal.